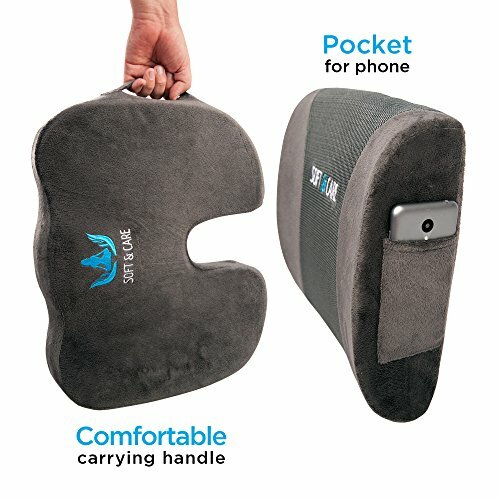 IS IT SO HARD TO CREATE SET WITH TWO PRODUCTS FOR DECREASING PAIN WITH MAX FEATURES? WE MADE OUR PREMIUM SOFT&CARETM SET – SEAT CUSHION COCCYX ORTHOPEDIC MEMORY FOAM + LUMBAR SUPPORT PILLOW. 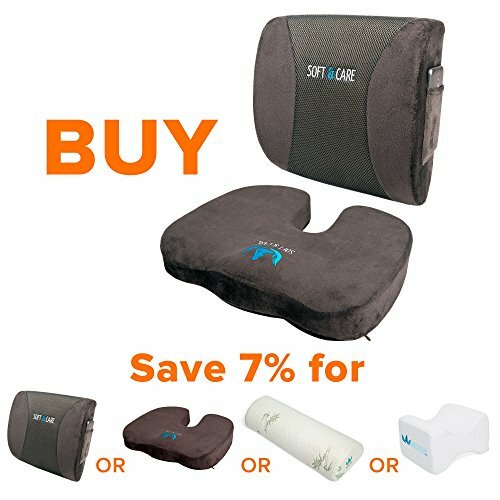 SAVE YOUR MONEY -YOU CAN BUY SET OF TWO PREMIUM CUSHIONS FOR GREAT PRICE. RELIEF FROM PAIN – back pain & sciatica, coccyx, spinal alignment, herniated discs, pregnancy back pain. FIX SEAT IN PLACE – with non-slip rubber bottom. EASY CARRY – cushion has built-in handle. LONG LIFE & EASY CLEANING – cause of washable velour zippered cover. RELIEF FROM LOWER BACK PAIN AND PRESSURE – Orthopedic, contoured design hugs your back, helping keep your spine in proper alignment. UNIQE POCKET FOR PHONE/MP 3 – You can put Your phone IN THE POCKET without any wires that «tie» You to the table and not to lose Your music. LONG LIFE & EASY CLEANING – with washable velour zippered cover. NOT GETTING TOO HOT – with 3D breathable mesh in the middle of pillow. 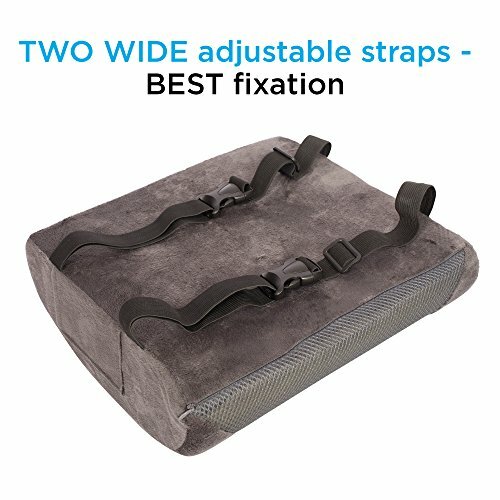 KEEP PILLOW IN PLACE – with TWO elastic adjustable straps. IF YOU DON’T LIKE TO BE CONSTANTLY WORRIED ABOUT PAIN WHILE SITTING – PRESS THE BUTTON «ADD TO CART» RIGHT NOW! 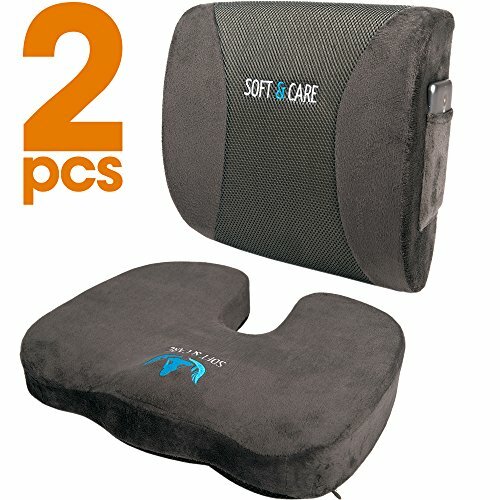 INCREASE LEVEL OF COMFORTABLE SITTING WITH SOFT&CARETM CUSHIONS SET! 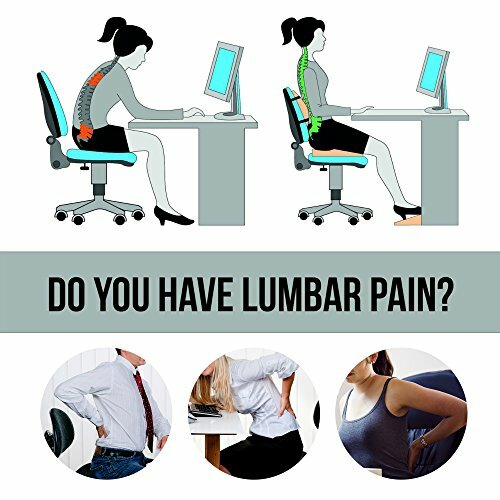 WOULD YOU LIKE TO SIT COMFORTABLY AND WITHOUT PAIN??? SOFT&CARETM WILL HELP YOU! 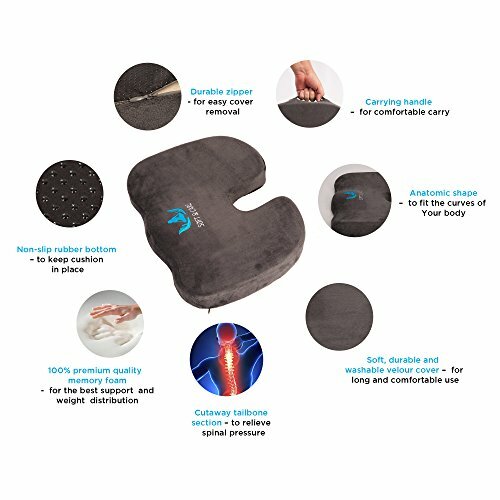 COXXYX SEAT ORTHOPEDIC CUSHION decreasing pressure on the coccyx because of anatomic shape and relief You from pain of sciatica, herniated discs, tailbone injuries, pregnancy back pain, etc. LUMBAR SUPPORT PILLOW relieves lower back pain and pressure. BOTH PREMIUM CUSHIONS TOGETHER WITH MAXIMUM FEATURES! Seat Orthopedic Cushion made with NON-SLIP rubber bottom – to keep in place, BUILT-IN HANDLE for easy carry, washable velour zippered cover for EASY CLEANING. 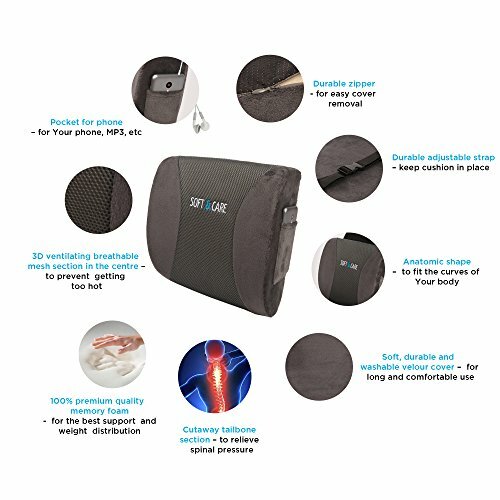 Lumbar Support Pillow has UNIQE POCKET FOR PHONE/MP 3, to prevent getting too hot – 3D BREATHABLE MESH and TWO ADJUSTABLE STRAPS – to keep in place. 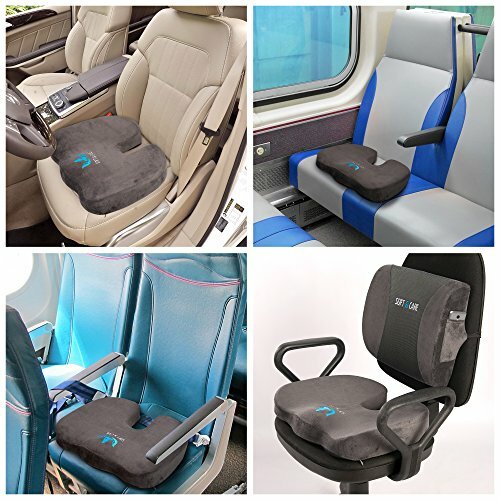 PREMIUM SOFT&CARETM SEAT ORTHOPEDIC CUSHION WILL HELP YOU with all hard surface – CHAIR in Your OFFICE, CAR SEAT in Your car, DESK CHAIR in Your home, AIRPLANE seat in Your plane 🙂 and a lot of other surfaces. 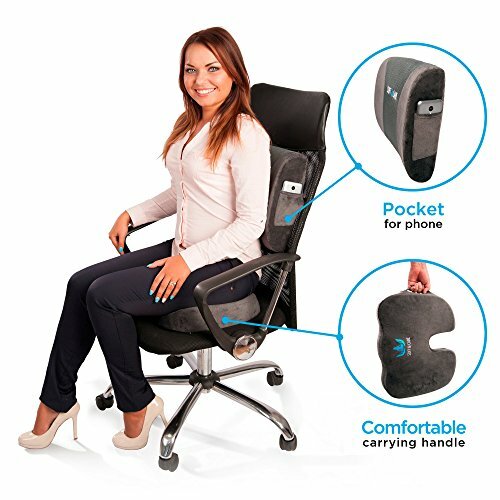 LUMBAR SUPPORT PILLOW will help great on most SEATS. PREMIUM QUALITY! Our cushions made of 100% pure high-density premium quality memory foam which create SOFT COMFORT & CARE and LONG LIFE for years and DOESN’T GO FLAT! WE GUARANTEE 100% SATISFACTION WITH OUR PREMIUM CUSHIONS SOFT&CARETM AS WE USE IT PERSONALLY! IF YOU DON’T LIKE OUR PRODUCT – WE WILL REFUND YOUR MONEY FOR 100% IN 60 DAYS RETURN WINDOW! ORDER IT NOW RISK FREE!